Seriously, I just read a post about saving every little scrap, or cutting everything you have into strips or squares for scrap quilts. Well and fine if you have a large sewing room/studio with lots of wall space for storage in those Sterlite 3 (or larger) drawer containers. But when every ounce of wall space is used up already what do you do if you want to stay organized and neat? I do have a large white hamper in my sewing room for leftover strips....but it just isn't large enough to hold everything. Suggestions please. I don't have a large sewing room. Scraps are limited to the double stack scrapbook boxes. (12x12). One holds pieces that are almost fat quarter size and the other holds smaller pieces. Scraps are starched and ironed. I do use them for machine embroidery. Earlier this year, I sent 3 zip loc bags full of scraps out to someone that will use them for charity quilts. I haven't missed one piece yet. Honestly, I don't do scraps so quite happy to pass them along. It's time to use up that hamper of scraps and make some pretty quilts. If they overwhelm you, send them on to someone else and bless others. Either choice is Win-Win! I have a large finished basement room that houses all my quilting including a longarm. I have purged numerous times because 2 quilters have died and my friends thought of me and gave me their stash. My quilt guild has a free table that is always full. I contribute monthly. The only thing I like to keep are long leftover strings. I’m obsessed with string quilts. Scraps smaller that a charm square are given. Charm squares go to my volunteer job where I teach young mothers how to make a baby quilt. If my studio looks like I’m a hoarder, it’s time to purge. Let it go if you will not live long enough to use it! I just finished my fourth scrap quilt. My scrap pile is a little smaller but I still have a clothes hamper full. No suggestions except sewing faster. Scraps do create a dilemma. The scrappy quilts are beautiful, but I truly am not inspired to make them myself. There are members of this quilting board who would gladly take them, so that is always an option. My very small scraps (under 2 1/2" for me) I put into a pillowcase-lined garbage can and when full, I sew it up to make an animal bed which a local shelter will take. Anything I think I will not use I pass on to a member on the board who can use them. She has gotten several boxes full and if she's as happy to get them as I am to get rid of them, it's a win win. I even have friends donating to the boxes now. I don't have space to save everything. That's the best "solution" I've heard so far but I'm afraid I could never sew fast enough to stay ahead of my scraps. I've tried to do the method where I cut them down into 2 1/2" squares, 5" squares or 2 1/2" strips until I have enough to do a scrappy quilt but they always seem to multiply faster than I can sew. Laughing is, and will always be, the best form of therapy! When you love and laugh abundantly, you live a beautiful life! If you're too busy to laugh.....you're too busy! It all comes down to what we value. I value space more tiny scraps. Since I don’t use anything smaller than a 2.5 square- anything smaller is clutter. I save one of each smaller scrap for a specific board member - I send them to for her postage stamp quilt in which she is putting literally thousands of 1.5 inch squares. Other than that, I trash bits for sanity’s sake. I like to give away whatever I no longer like or want- again, a value judgment, which is personal. Too much of my house has larger clutter I’m dealing with(ad nauseum). That said, if anyone wants my tiny bits, just let me know. If you value them, I will send them as I go. Last edited by zozee; 09-12-2018 at 06:51 AM. We will be leaving for Arizona in about 4 weeks so yesterday I started going through my stash to leave behind anything I won't work on for the next 6 months. I created two piles to donate yesterday, one for the group I quilt with and one of poly-cottons and uglies that was given to me. But it can be difficult. Do you have any uglies? Most of us have so much fabric why keep anything that you don't think is pretty. There is always some who will be happy to take your donation. I know of one group that donates their scraps to one member that apparently could not afford to quilt otherwise. I like bits so I have had some donated to me and it was fun. I made a crumb quilt with only a couple of pieces from my own stash and I have donated the rest of it to others. I am trying!!! not to buy more fabric. As some one mentioned Priorities. What do you like to work with? Do you like scraps and scrappy quilts? Perhaps the best advice is from Tartan, "Sew Faster". I have only a few sizes I save. 5 inch charms---10 inch layer cake ---2 1/2 inch strips. When they start to build up I make a top. I work with a charity group that gets alot of donated fabric for their charity quilts. I have an abundance of it and do not want to spend time of a huge cutting system for scraps. And then have to store them,. We each have to find our own way. I am lucky enough to have a sewing room which is currently undergoing a major cleaning and reorganizing effort, I've been lazy and haven't done it for about 5 years so I have a lot of disorganization to fix. It's the smallest bedroom we have, less than 10x12'. Unfortunately for me, the closet holds long term storage non-quilting items I'm not willing to give up yet, like a full sized Jenny Lind spool bed that's been in the family for decades, my/my son's cradle, sleeping bags and other things, it would otherwise hold most of my fabrics. Instead of the closet, I have two rolling wire rack Costco storage units, a large bookcase (not all quilting related), a desk, a sewing table, and a small non-moving set of shelves. I have taken some "before" pictures, when I get done I will take some "after" shots. There is so much storage when the ironing board is set up there isn't much room, basically a clear path from the door to the wall that goes between the desk and table. I mostly work with scrap quilt so most of my stash are small pieces (typically under 1 yard). Plus I've been quilting since 1978 so I've accumulated a lot of fabric. I used to keep my scraps in a hamper and that worked well enough for awhile... but it wasn't pleasant going through the hamper -- I had to dump everything out every time and it was lumpy and and tangled and everything always needed ironing so I decided I needed to do something better. First thing I did was decide I didn't have to save every single piece of fabric. If you are going to make a string quilt, fine, put the long ragged ends in a box specifically for that. Me, I decided that 6" was really what I wanted to keep (I've changed my mind to 6.5 as being more useful), although I will save trimmed WOF lengths in 4.5", 3.5" and down to 2.5". When the yardage gets low it gets cut into the largest strip size possible. The strips I keep sized sorted and roughly colored sorted in a box specifically for them. Cut and stacked neatly they take up much less space than they did in the hamper. When I start a project, I go to the strips first. Larger pieces of fabric are kept in color or themed sorted boxes, including fat quarters. Because I'm behind on my quilting and because what I really love to do is piecing, I have two large clear plastic tubs with unfinished tops, combined with their backs and bindings. One large tub of "pieces big enough for backs" that don't have tops yet. 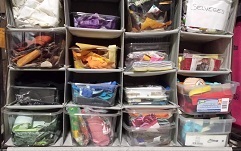 Because of my style of quilting (typically using charms or no more than 4 of any given fabric), it often takes considerable time to collect enough pieces so I have small project boxes. For instance I am just about done cutting fan blades for a Thanksgiving themed fan quilt. Another box has my "postcard" quilt pieces together (i think after my recent trip I might just have enough!). If you work in an office (or know someone who does) the "paper boxes" (cartons reams of paper come in) are a lovely size, not too big/not too small, and sturdy enough to stack 4 to even 5 high. I know a lot of people like clear storage but my fabric may indeed sit for years so I like the light protection cardboard offers, I line the boxes with acid free tissue paper. Note: you should NOT store cardboard boxes on a cement floor, moisture will wick in. Now that I no longer work I buy the heavy duty (light weight is not enough) office file storage boxes. I also offer charms to people wanting specific things, post here or send me a private message. I have a number of themes/novelty fabrics as well as more standard fabrics. It can be nice to get stored fabric from someone like me because it isn't what is out in the stores that you can find yourself. This is a sincere offer! I really am trying to not buy new fabric (not with much success...) Since I was diagnosed with my vision issues a few years ago I have already given away about 9 full black plastic garbage bags of fabric. Quiltville.com is a marvelous web site by Bonnie Hunter. It is so fun to explore the site. Bonnie has marvelous tips on handling scraps and her free designs are great for using up scraps in every way imaginable. She also has published pattern books. Yes, was just going to post about Bonnie Hunter - she's a scrapaholic and has wonderful methods, great blog, instagram - love reading and trying her methods. Yes, and great books she's written, new one coming up in December. I am trying to do some of Bonnie's techniques of using scraps - it's all a transition but some get ideas. She is quite an inspiration too. Any scrap piece that is about fat-quarter size gets folded into an approxiamate 5" square and stacked on my top stash shelf in a closet. Anything smaller than that gets cut into 2.5" squares and put into one of two shoe boxes. One box has no duplicates of fabric, and the other has many of the same fabric. I belong to a swap of these squares on this board. This year on my birthday I will receive 1,800 different fabric 2.5" squares from all of the swappers. I put them in the no duplicates shoebox. On their birthday I give them 50 different squares from my shoebox with many duplicates. This way I have thousands of 2.5" squares that are not duplicated stored in a shoebox. When I'm ready to swap, I get those squares from my duplicates shoebox. I hope all of that makes sense. Bottom line I have the 2.5" squares in two shoe boxes. The pieces that are a little larger get stacked on shelves. I love the plastic shoe boxes. I find that I can separate my scraps by size/ color or any criteria I want and label the boxes. The boxes stack neatly in places I'm not able to use for anything else or they can go up on shelves. I love the flexibility of these inexpensive (about $1) boxes. I love being able to bring the whole box to my work table when I am looking for pieces to include in a quilt. I use my Studio 2 cutter to "clean up my scraps into particular sizes. I use Moda's precut sizing to guide me when cutting scraps. I figure if my scraps are in standard precut sizes, I will be able to find a pattern to use them. So far it's working for me. I don't save scraps to use anymore. When I did, I found I rarely used them and the bins and drawers were full of scraps. Now I put my scraps in a large tub and when it's full I take it to my guild's free table or to a retreat I'm going to. Everyone loves to dig through a scrap bin. I do to but not my own. I don't get rid of any scraps from the quilt until the quilt is finished. I get tired of hearing but that is such a waste to get rid of them. I'm okay with that, no guilt at all. My goal is to make the quilt or project not to use up fabric scraps. As I’ve only been quilting for a couple of years I have some scraps but nothing like the mountains some industrious quilters seem to have. I recently decided that when I’m ‘between’ projects I will make house blocks from the scraps of the last quilt. I now have about thirty 6-inch blocks completed and will keep adding to the pile until I’ve got enough for a small quilt. You will like this quilt with your "precuts" It's what I plan on doing with mine. It can be made smaller, say 7 three piece units in 3 rows for a 41.5 x 50 baby or lap quilt. And a less than 1 1/2 yards of backing fabric. You are so right in finding our own way...our minds all process differently so what works for one does not necessarily work for others. And if it means giving scraps to someone else that's okay. There are some folks who love to have scraps because they can indulge in their creativity on a limited income or like me getting others' scraps of fabric choices which I wouldn't normally buy. These scraps take me out of my box and stretches my ideas of quilting. I have my DD old bedroom for my sewing room--I have my cutting dies stashed under the cutting table in the middle, the trundle bed has no 2nd mattress--it holds my "kits" (where I've purchased all the fabric for a specific pattern but haven't touched yet), I have have one of those plastic 5 drawer storage units with the weird, small scraps sorted by color. Then my larger scraps and yardage is sorted by color into an old china cabinet (with the non-glass doors hiding stablizer, etc). I like to make string quilts and have those sorted by dark/lights into huge zip lock bags in the closet and also have all the flannel scraps in the closet. Not super organized but it works. I do go through my fabrics once a year and take those I don't want or seem too small to my guild's garage sale. I have a smallish bin in my room. When it gets too full, I put a listing on Craigslist saying free to whoever wants to come and get it. Scrap quilts are not my thing and I would rather someone else have them than my throwing them out. Moira: Please explain what you mean by a 'House block'. Cheers. I really don't think the point is to keep scraps until you are so inundated and they take over your sewing room and/or house. Unless you really like scrap quilts, there is no point in making them. If you can't use the fabric, or you can't sew fast enough to use up all of your scraps, then I would suggest that you keep the scraps that you really like or can work with comfortably and pass on the rest. As suggested above, there are many places to donate them: thrift stores, friends that like the scraps, senior centers where they quilt, guild meetings (even if you don't belong, they will take your scraps), and the like. You could even put an ad in Craig's List or the free Penny Saver and advertise your scraps. If you don't want them to come to your house, you can offer to meet them somewhere in a public area. The main point is to keep something useable out of the garbage dump. I love this discussion. And I love scraps. So many great ideas here! I keep them in a 16 cubby shoe stand under my sewing table. They are mostly sorted by color and type. (Cotton, flannel, minky, selvages etc.) It kinda looks like a box of crayons to me. Sew fun. Makes me want to use them. I don't precut. I do collage & applique, and never know what size I might need. I also swap with other scrap lovers in my guild so that we all have a wider variety to pick from. And, I donate some to a buddy who has a school class that uses everything- including batting in their art projects. Even the smallest ones get used in pet beds. I use another shoe cubby just like this, also under the table, for often used supplies: glue, scissors, rotary blades, needles/pins, etc. Works for me. Not a great picture, sorry. I have been using lots of them, and have added & subtracted lots of colors that don't show up here.